Heating is provided by electric panel heaters and the wood burning stove. A welcome pack is provided. Catering The owner of Whitesand Shiel is a professional cook and offers a homemade meal delivery service to guests. She also runs cookery classes at her B&B in Berwick-upon-Tweed about a 15 minute walk from the house. Please enquire for further details. Wine delivery is available in conjunction with renowned wine merchants Corney & Barrow or Majestic in Berwick-upon-Tweed. Tesco, Asda and Sainsburys will also deliver to the house. Wonderful attention to detail within a perfect setting and wildlife aplenty. Thank you very much for taking the time to post a review. We are so pleased to hear you enjoyed your stay at Whitesand Shiel. My partner and I together with our Scottish Terrier Max had a thoroughly enjoyable stay. The property was in an excellent location for walking, bird watching, resting and relaxing. And to my delight seeing the Flying Scotsman steam over the viaduct. It was clean, set up to a very high standard with an amazing shower and a super comfy bed. There was food in the fridge and a bottle of wine to help the first night relaxing process begin. We did not want to leave. The owners were great and very friendly, nothing was too much trouble. And we would recommend this property to our friends and family and we hope to stay there again in the future as there is plenty more for us to see and do in the area. Thank you so much for taking the time to post a review, it is greatly appreciated. We are so pleased to hear that you enjoyed your stay at Whitesand Shiel. It’s a stunning property with great views. I hope we can welcome you back in the future. Thanks again for your kind comments. Absolutely 5* conversion. Everything has been thought of for comfort and luxury and practicality. Thank you very much for taking the time to write a review. I'm so pleased you enjoyed your stay at Whitesand Shiel. It's a beautiful property in a stunning spot - even in darkness when the railway bridge is alight with all of the different colours! Thank you again for your kind comments. I hope we can be of assistance in the future. There are excellent walks from the house both along the river and into the town and surrounding countryside. Berwick’s beaches also provide excellent walking or enjoy a wander around the town’s historic Elizabethan Walls, the best preserved in Europe. For something a bit different, take a boat trip from Berwick upstream to Paxton House, a superb Adam mansion boasting an impressive collection of art. Whitesand Shiel offers guests the best of both worlds; the location is surprisingly peaceful and private and yet Berwick’s shops, pubs and restaurants are just a ten minute walk from the front door. Unusually for this part of the world, Whiteand Shiel is one of very few properties where a car is not required. 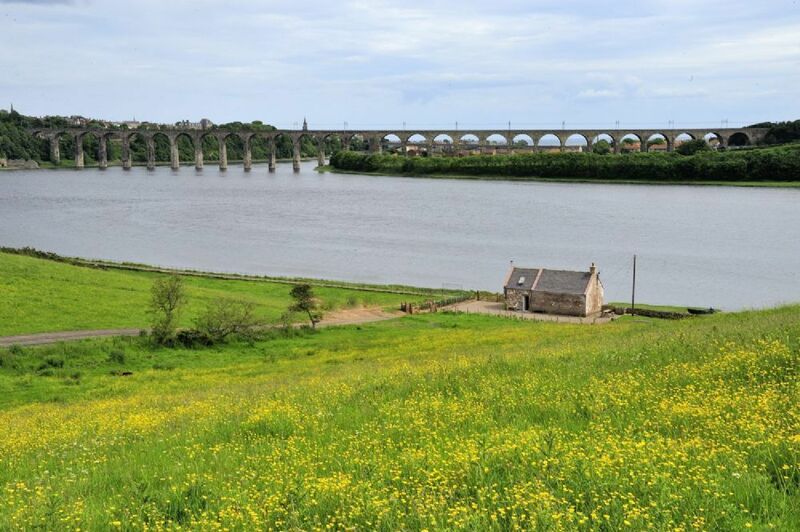 Berwick upon Tweed is on the main East Coast line which also links to the west coast and the station is about a 10 minute walk from the house. Whitesand Shiel is an ideal base for exploring Northumberland’s Heritage coastline, 25 miles of golden sands and secluded rocky coves that remain almost deserted even in the summer months. Some of our favourite spots include the stunning beach at Bamburgh, miles of pristine sand, popular for walking, riding, surfing, coasteering and kite surfing. The magnificent views from the cliff top walks at St Abb’s Head and the Holy Island of Lindisfarne. This tiny, picturesque island linked at low tide to the mainland, is an overwhelmingly mystical place, home to the evocative remains of a ruined eleventh-century priory, a beautifully restored castle and the infamous Lindisfarne Mead. Head to the Farne Islands to see the resident seals and incredible birdlife including Puffins. With the legendary Tweed on the doorstep, Whitesand Shiel is an ideal base for lovers of fishing. As the river is still tidal at this point, fishing for trout, salmon and sea trout is free but catches must be returned. Slightly further upstream is some excellent fishing starting at just £5 per day for a trout permit and £20 a day for salmon. Golf fanatics will also not be disappointed with 34 courses within a 30 mile radius including the links courses at Goswick, Bamburgh and Eyemouth and parkland courses at The Hirsel and Roxburghe.